Is Your B2B Marketing Consultant Ethical? I had lunch recently with CPA Lynne Leavitt of Brakensiek Leavitt Pleger LLP, The Eclectic Accountants & Business Consultants, and Maureen Bernstein of Kaercher Campbell & Associates Insurance Brokerage. We actually talked about – gasp! – ethics. Lynne heads up programming for one of our networking groups and mentioned she has a speaker on ethics scheduled for later this year. She explained that as a CPA she is bound by the AICPA’s Code of Professional Conduct. Maureen added that, thanks to former Attorney General Eliot Spitzer, property and casualty insurance brokers are bound by a code of ethics. Many professionals service providers are required to follow a code of ethics. But marketing and consulting don’t have a requirement. The question becomes, how ethical is your marketing service provider? Your consultant? Today’s business owner expects transparency – are there any fees that haven’t been disclosed? Is my marketing consultant being honest about what marketing tactics get results and how much they truly cost? Are they advising me to spend money that isn’t necessary? Have they done this kind of marketing work before? 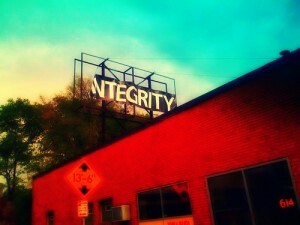 Does your marketing service provider have a code of ethics? Please comment below. Photo by aunniepete on Flickr. Creative Commons 2.0 License.